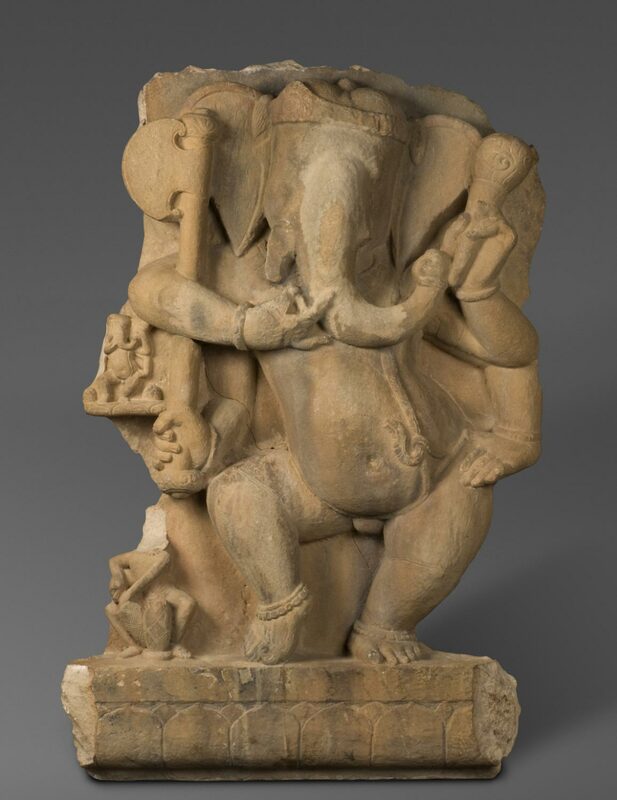 Pot-bellied and elephant-headed, Ganesha is the most widely worshiped Hindu god, for to the ordinary person he is the source of all success. As Lord of Obstacles he is extremely powerful; he must be invoked at the beginning of every undertaking. His is the power to put obstacles in the way--and to remove them. 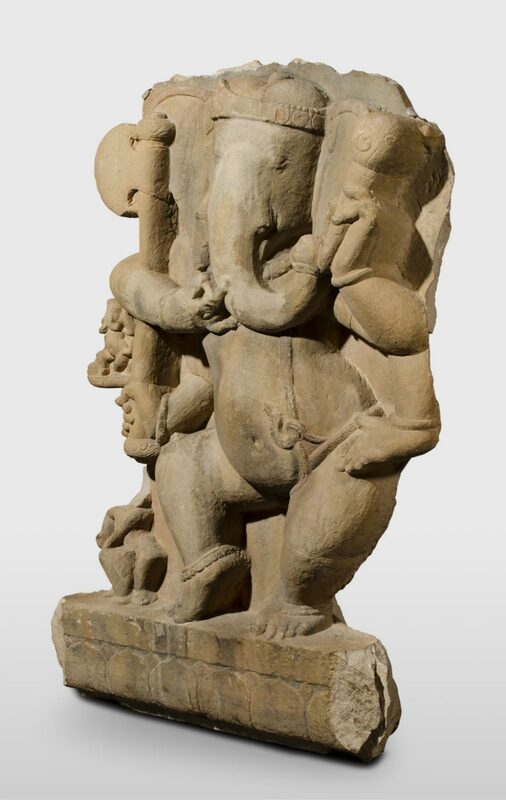 Ganesha dancing, as he is shown in this reddish sandstone sculpture from a temple devoted to the Great God Shiva, his father, is the image that most fully conveys the joyous wisdom that he embodies, the knowledge that humans are one with the Absolute. Four-armed, his body sways in a triple bend to the rhythm beaten out by the spirit drummer below him on the left, and his dance reverberates throughout the universe. His main right arm cradles an ax, his most conspicuous emblem, held by the lower hand. 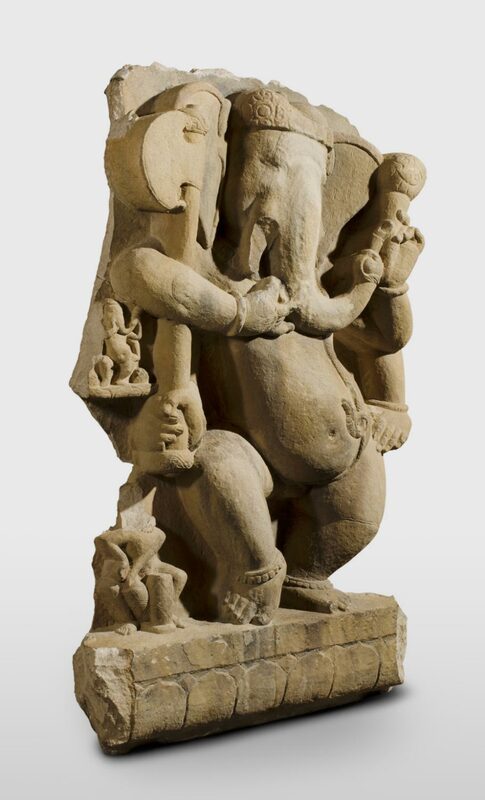 His upper left hand holds a radish--a delicacy for an elephant--which symbolizes unity. Stella Kramrisch, from Philadelphia Museum of Art: Handbook of the Collections (1995), p. 51.